Learning how to cook little smokies is very easy and they taste great. You can use them as a main dish or for an appetizer at parties. Learn here. 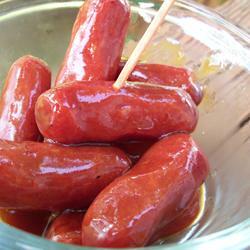 When you think of little Smokies, you might be reminded of those little cocktail sausages or wieners served at parties. They are essentially a "mini" hot dog or sausage and there are many different ways to cook and serve them. Little Smokies come in a variety of flavors including smoke flavor, cheese and spicy pepper. Per sausage, they have relatively few calories since they are small. Serving sizes can range from 2 to 4 sausages for appetizers and 8 to 10 for a meal with a side-dish. You can bake them, boil them and poach them in sauces for more flavors. These sausages are a hit at parties, for snacks or a light meal. They go good with baked beans, potato salad, and green salad or over rice with sauce. You can even wrap them in refrigerated bread dough to make, "Pigs in a Blanket." These are a favorite with kids! There are many different variations and they are quick and easy to make. They are also easy to serve and can be eaten with a fork or a toothpick inserted into them. In slow cooker, stir together BBQ sauce, onion, brown sugar, ketchup and Worcestershire sauce. Add little Smokies and cook on low setting for 2 hours. Heat oven to 375 degrees F; while oven is preheating, cut up bacon into 3 pieces each slice and wrap around each smokie. Arrange Smokies on wooden skewers, one for each person. Lay skewers in baking pan or on baking sheet and sprinkle with brown sugar and bake until done. The skin will be crispy and the brown sugar will be caramelized. How to cook little smokies? Get a perfectly sour taste with this recipe. Mix ketchup, mustard, vinegar, cloves, brown sugar and cinnamon in a large saucepan. Mix well. Drain juice off the packages of sausages and place into pan with sauce. Allow them to simmer for 30 to 45 minutes on medium-low heat until Smokies are heated through. Stir occasionally while cooking. For preparation in a Crockpot: Mix ketchup, vinegar, cloves, brown sugar and cinnamon in a bowl. 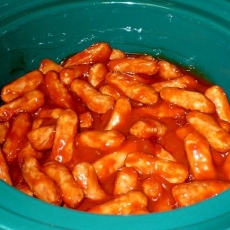 Place drained Smokies into Crockpot then add sauce. Stir until sausages are well coated and cook on low for 2 to 4 hours. You can keep your Crockpot on the low setting to keep them warm while serving. Serves: Depends on how many people you are feeding; appetizer/meal, etc. Preheat oven to 350 Degrees F. While oven is preheating, cut bacon crosswise into 3 or 4 pieces. 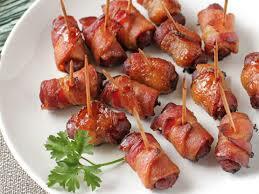 Wrap each Smokie in a piece of bacon and attach with a toothpick. 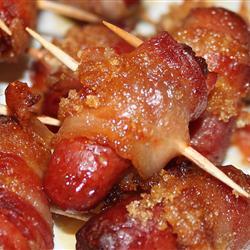 Place Smokies on a baking sheet or dish. Cover each with a sprinkle of brown sugar and place in the oven to bake for 18 to 22 minutes until bacon is crispy and brown sugar has caramelized. Serve with spicy ketchup dipping sauce. Mix all ingredients together well in a small bowl. Place in refrigerator a few hours ahead to blend the flavors. You can warm the sauce a bit before serving so it doesn't cool the cooked smokies when used. 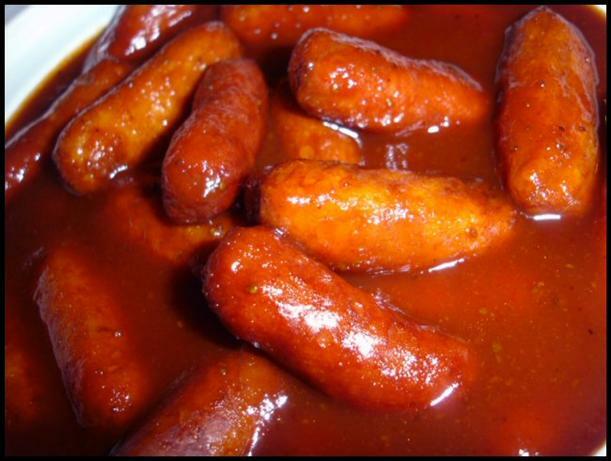 Mix Smokies, grape jelly and barbeque or chili sauce into a slow cooker and allow them to simmer on low overnight. If you wish to turn them on the day you are serving them, just make sure you turn them on very early in the morning and allow them to simmer all day. You can also keep these on the low setting during serving times to keep them warm. The flavor improves with longer cooking times and these will be a hit with everyone! How to cook little smokies? You surely have a better idea now.